Atterbury, the leading South African real estate developer and investor, has taken the next step in its leadership succession plan, restructuring and realigning its executive management. Many point to online retail as a key challenge to the Retail Property Sector, and no doubt it is one of the challenges, as technology marches forth. 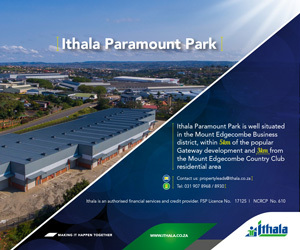 Inospace Property Fund, an owner and operator of branded business parks providing conventional and flexible workspaces, has completed the acquisition of seven industrial parks in Cape Town and Johannesburg for R212 million, bringing the total value of its portfolio to over R1 billion. JSE-listed diversified real estate investment trust Redefine Properties’ 159 unit Park Central is racing towards the sky and is expected to be ready on schedule during Q2 2019. Liberty Two Degrees (L2D) is pleased to announce the commencement of trading of Liberty Two Degrees Limited (New L2D) on the Main Board of the JSE today, following the successful fulfillment of the conditions precedent to the restructuring transactions. When it comes to property, the adage goes, “Position. Position. Position.” That’s why Broll Property Group is proud to take its position as Platinum Sponsor of the Africa Property Investment Summit & Expo 2018 (API 2018).It will be held in Sandton, Johannesburg, on the 20th and 21st of September. JSE-listed diversified Real Estate Investment Trust (REIT) Redefine Properties’ (JSE: RDF) welcomed shoppers to the new revamped Benmore Centre, Sandton’s popular neighbourhood shopping destination when it officially opened during end August. Redefine had started work on the ZAR252 million refurbishment programme during late 2016 and was completed on schedule. Fortress REIT Limited, the diversified property group, has secured Vodacom as a major new tenant at its Louwlardia Logistics Park development in Centurion for a period of five-years, a major coup for the company, which also has We Buy Cars and Goldwagen Car Parts as tenants at the same facility. The Wanderers Golf Club, in partnership with Investec Property has embarked on a process to develop an iconic mixed-use precinct unrivalled in Johannesburg’s Northern Suburbs.